What is a Toslink cable? What is a Toslink Cable - Optical Digital Audio Cable? TOSLINK or Toshiba LINK is a connection standard for digital audio streams. It is a standard which uses fiber optic cables. Toslink cable, also know as an optical digital audio cable is used for linking components like surround sound home theater systems to a HDTV or HD cable box. Toslink cables use a very unique connector and usually have a small plastic protector covering the fiber optics which is removed before connecting. A good cable costs about six to ten dollars for up to 25 feet. Most digital TVs have a Toslink output for sound. How to listen with headphones to a TV without a headphone jack. A standard in digital video and audio is PCM, pulse code modulation, and Toslink was invented by Toshiba in the early 1980's to connect their recievers and CD players to receive the PCM bitstream. It became a common connector for most manufacturers. Quartz glass optical fibers may be used, but most likely your cable will be made with either quality multistrand plastic optical fibers or cheaper 1mm plastic optical fiber. Toslink cables can run up to 10 meters in length, but are typically 5 meters or less. Anything longer than 10 meters and it is likely that a signal booster will be needed. Newer consumer electronics, however, can have Toslink cables that will run 100 feet or more. As audio cables go, the toslink cable has become very popular and you can find them at varying prices through many different manufacturers. Digital media includes CD's, MP3's and DVD’s, in which audio signals are processed by a chip. Digital audio cables are manufactured with the aim to preserve and transmit the digital signals, maintaining the highest possible quality. They come in two distinct flavors; coaxial digital audio cables with an RCA connector and optical digital audio cables with the Toslink connector. Coaxial cables transmit digital signals in pulses of electricity. They consist of copper wires shielded from interference with the help of surrounding aluminum wraps. The wires are housed in a strong outer case. Coaxial digital cables used for audio applications have an impedance of 75 ohm, which means they can handle considerable energy. Also, they have a larger bandwidth than a normal RCA cable. The other type of digital audio cable is the optical cable. Optical cables are the premier choice for transferring digital audio signals between components. 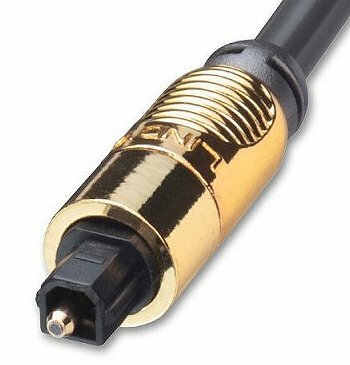 They do not use RCA style connectors; instead they use what are called Toslink (or EIA-J). These cables use pulses of light to transmit data, instead of copper wire. Since they are immune to interference from electromagnetic and radio-frequency interference, the signals do not degrade and weaken over long distances. Distortion caused by resistance, inductance and capacitance is eliminated, with the result that the best reproductions of digital signals are made possible. Even though optical digital cables are more expensive, for true audiophiles looking for a superior experience with audio, nothing beats optical cable technology. Be careful using optical cables. If they get bent too far or stepped on, they could be damaged. Choosing Between Coaxial and Optical Cables for digital audio transmissions. Many audio/video components allow both types of connectors, either coaxial or optical. Most users will not be able to tell the difference in sound. The circumstances outlined below show the pros and cons of both, and should help choose which cable is right for you. 1. Optical cables are a better option in environments with lots of electromagnetic interference, for instance, near personal computers or power cords sending out radio frequency noise. 2. Optical cables should be the preferred option for long distance transmission. While 3 or 6 feet won't make much difference, if you need speakers that are spread over 25 to 50 feet, optical digital cables are definitely the way to go. 3. In low budget circumstances, coaxial cables are usually more economical. 4. Coaxial cables are the only choice when the sound system set-up requires you to bend the cable to fit certain areas. Also, the performance of optical cables may get compromised if the system is moved frequently. HDMI connections provide another way to carry digital audio signals. The HDMI protocol combines high-definition video, multi-channel audio, and inter-component control in a single digital interface. This lone interconnect has the ability to transmit uncompressed digital video and up to eight channels of audio from source to display. Even more, the HDMI connection enables audio/video components to share data and commands, thus unifying an oft-disjointed collection of "boxes" into a real, working system. Based on Silicon Image's TMDS ® technology, HDMI is also fully compatible with PCs and display devices incorporating the Digital Visual Interface (DVI) standard. For all of its amazing ability, the HDMI connector is surprisingly compact and robust. Based on copper cables (as opposed to optical fibers), HDMI makes few demands as to cable length and bend radius. Runs to 50 feet or more are easily accommodated. HDMI may well be the perfect way to transmit high definition images to a ceiling mounted projector or from multiple source components to a single control processor. HDMI is rapidly finding its way into many upscale home cinema products. The important feature of fiber optic cables is that they convert audio signals into light impulses as opposed to electric signals. TOSLINK cables usually transmit their signals as the red LED lights. The TOSLINK standard was first developed by Toshiba to provide connections in its CD players. It soon caught on and became the most popular connection format for audio signals. It is mainly used to connect CD player, DVD players, satellite dish receivers and other equipment which require reliable means of transporting audio signals. An important difference between TOSLINK and other audio cable formats is that since TOSLINK uses fiber optic cables, it is not susceptible to electromagnetic disturbance and line noise. TOSLINK cables are usually restricted to being 5m long. The maximum possible length for a TOSLINK cable without a signal booster is found to be around 10m. Depending on its application, TOSLINK cables may use 1mm thick plastic fiber optic wires which are inexpensive or for high quality equipment it may also use high quality multi-strand fiber optic cables. If you shine a light at one end of a coil of TOSLINK cable, you will be able to see it at the other end. This is because fiber optic cables are made up of light conducting material and hence transmit the light from one end to another. There's a secondary type of jack called mini-toslink jacks. There are adapters on the market to connect the mini toslink to the regular standard Toslink cable. The most common users of the mini-toslink jacks are Apple computers and portable mini-disc players. 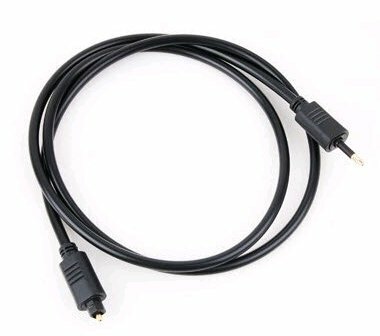 The audio signal from a Toslink cable was originally limited to 48 kHz at 20 bits, but has now been extended to support all modern formats. The only exceptions to this are DTS HD audio streams, TrueHD, and Dolby Digital Plus. HDMI is required for these audio formats. After Toshiba's invention of the Toslink they're now the standard in audio cables, to connect CD players and other things to the main component. There are many manufacturers now so the name of Toslink describes the cable not particularly related to Toshiba. Manufactured 1983 to present. Toslink (EIA-J) fiber optic digital audio cables carry digital audio data in the form of light pulses, rather than using electricity, eliminating the distortions caused by inductance, capacitance and resistance of wire cables. Digital Audio inputs and/or outputs are available on many newer Dolby Digital (Dolby 5.1, 6.1, AC3, Prologic, etc) and DTS surround sound receivers, DVD players, CD players, minidisc players and recorders, MP3 and DAT recorders, professional Audio Cards for Computer Digital Audio workstations, Outboard AD/DA Converters and satellite dish receivers. Compatible with S/PDIF, ADAT's, DAW's and Dolby Digital DTS audio devices using the Toslink interface. Toslink connectors are used on DVD's, CD and Super audio CD players, and surround sound receivers. 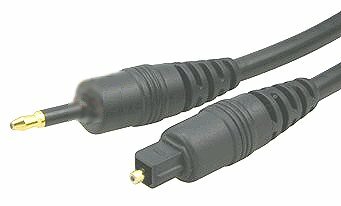 3.5mm "mini" plug Toslink connectors are generally used for minidiscs, and other small digital audio devices. 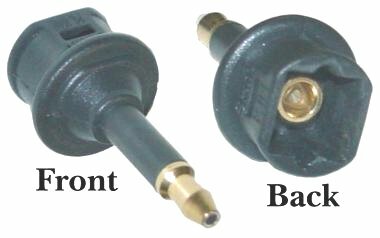 The image above shows the mini-Toslink connector (top) and the standard Toslink connector (bottom). Most of the time you will find the standard Toslink jack on the rear panel of components. Some jacks will have a door/flap to protect the interface. Sometimes the cable will also have a protector covering the optical connector and this should be removed before use. Adapters are available to go from one to the other type of connector. The TOSLINK connector was developed by Toshiba of Japan (TOShiba LINK) for the purpose of transmitting digital audio signals. TOSLINK jacks are covered with a small plastic cap; removing the cap exposes the TOSLINK optical connector inside. A TOSLINK output will glow bright red when it is being powered, and likewise TOSLINK cables also glow bright red at their tip when they are in use. TOSLINK cables are not made of wire but rather a piece of fiber optic cable -- that is, a very thin thread of glass. All TOSLINK connectors conform to the SP/DIF (Sony Philips Digital Interface) standard, a digital protocol designed to ensure compatibility between home consumer digital audio devices. Portable minidisc recorders are not fitted with a TOSLINK plug, so a special TOSLINK-to-miniplug cable is needed in order to use TOSLINK with a minidisc recorder. The cable's connector is rather different than almost all other cable connectors and fits into its jack on the audio/video component with a secure linkup. The cylinder fits into its hole and the connector fits snugly around the fiber optic cylinder. You can actually see the red light from the cable's end if you disconnect it from the jack. (Do not look directly into the light) The digital information from the audio bitstream is transmitted using light from a LED (usually red) instead of copper wires using electricity. HDTV and HD cable boxes, satellite receivers and surround sound systems can all use optical audio cables to transmit the Dolby Digital signals to a decoder for ultimate amplification and delivery to your loudspeakers. SPDIF is an acronym for Sony Philips Digital Interface and is a CD "Red Book" standard digital audio transfer file format. A SPDIF interface can transport either stereo left-and-right channel information or multi-channel sound. It is typically found on audio and a/v equipment such as CD transports, Laser Disc players, DVD players, some digital satellite products and computer sound cards where it is implemented using an RCA connector. A SPDIF interface is a 75-ohm connection, identical to composite video in specification. Short for Toshiba Link, TOSLINK is also a CD "Red Book" standard that allows for digital audio (both left and right channels or multi-channel sound) to be transported between components using an optical conductor and light as the carrier. Contrary to popular belief, TOSLINK does not use laser light but instead relies on the output of a simple LED. The Achilles heel of TOSLINK is the optical quality of the interface. The plastic conductors used in cheap cables can corrupt data and compromise performance. TOSLINK connection performance is somewhat limited by the bend radius (bending a light conductor causes internal reflections and signal loss) of the conductor design. Additionally, the TOSLINK interface is length sensitive with maximum performance available only with runs of less than 20 feet. The distance over which Toslink can operate is quite restricted, one reason is the shocking loss in the cheap all-plastic fibre (APF) commonly used. Toshiba cite a maximal length of 40m for their Toslink 190 modules using APF. This can be pushed out to 1000m with plastic coated fibre (PCF) which has a silica core with lower losses than APF. However, it is more delicate and is not common in the consumer market, so a maximum unbroken APF distance of 40m is the practical limit on Toslink connections. Electrical digital interfaces are usually presented on phono (RCA jack) connectors, or rarely as a BNC connector. Cable with a 75 ohm impedance should be used for best results on longer runs. In practice for the typical 1.5m cable length a regular phono analog cable usually works fine. Optical connectors are usually a square connector moulded onto the cable. Unlike electrical connectors which can be resoldered and changed on a cable at home, optical connectors and cables need to be purchased ready-made. There is an alternative type of optical connector which goes into a 3.5mm jack socket for portable audio devices like minidisc players. Adaptors from this to regular Toslink connectors are available, though it is better to use an optical cable with Toslink plug one end and the 3.5mm optical plug at the other. Optical cable is less flexible than coaxial cable and should not be kinked or bent tightly round corners. Cable has standard Toslink and mini at the other end. In general, where there is a free choice, coaxial digital interconnects are cheaper and easier to use within an A/V stack, but optical connections have their place for eliminating ground loops to PCs and in more extended systems like home studios where ground loops are harder to avoid. These cables use 1mm wide low-loss, low-jitter synthetic fiber and heavy metal connectors to dampen vibration for the cleanest possible signal, even at extreme volume levels. Perfect for home theater connections or home high fidelity audio. It is possible to connect two optical cables together thereby increasing the length by using a female/female coupler of the proper size. 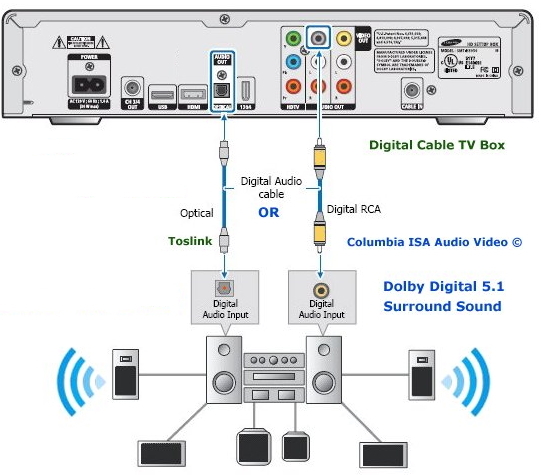 To send digital audio from a cable TV box or HDTV to your surround sound system, connect an optical (Toslink) or a RCA digital coaxial cable from the source device output to the sound system/decoder input as shown in the diagram. There are switchboxes available for multiple inputs and also for conversion from optical to RCA or RCA to optical should your sound system need this support.